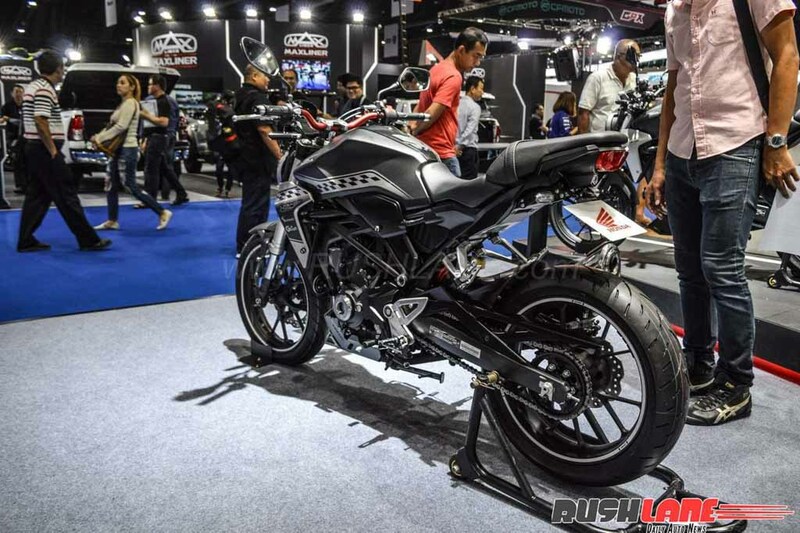 Honda officially revealed an accessorized version of CB300R at the Indonesian International Motor Show. 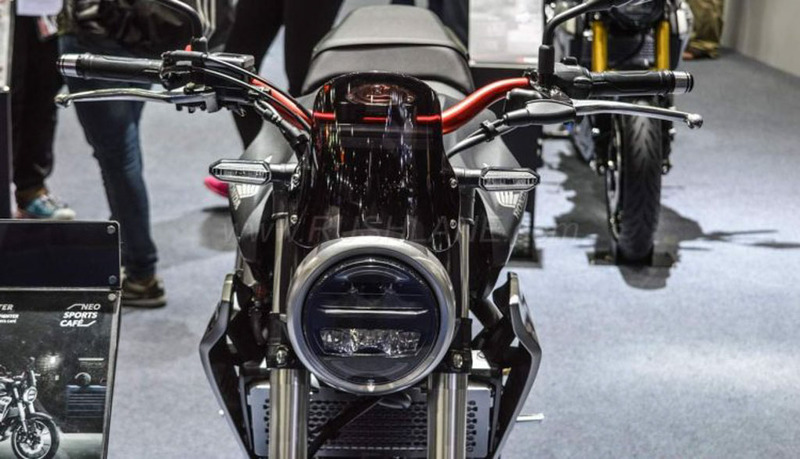 The CB300R is a new series of naked motorcycles based on café racer theme and the accessories shown at the expo bikes lift the appeal of the CB300R Neo Sport Café. 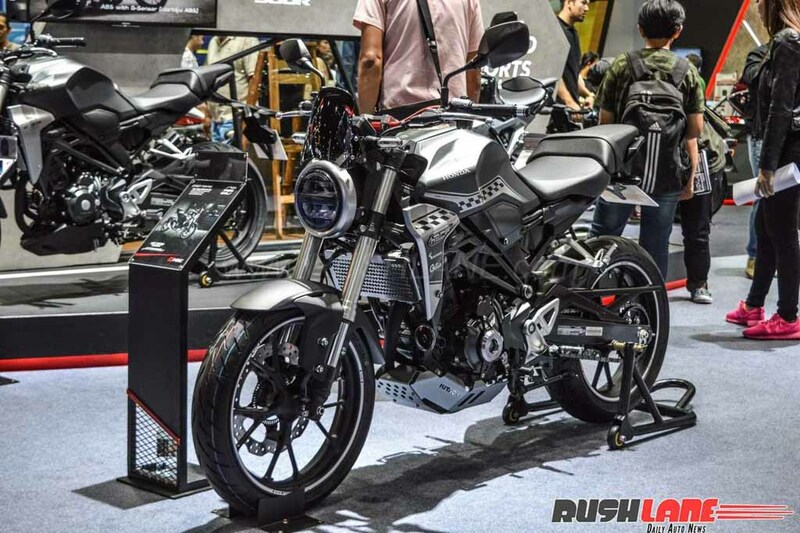 The changes starts with tinted visor above headlamp, red colour for the handlebar, radiator cover, silver finish for the crankcase protector, sporty decals on various parts of the body and a special matte grey paint job. Honda CB300R Neo Sport Café made its global debut in EICMA last year. The design of new model follows the foot steps of popular CB125R and CB1000R. The round headlamps with minimalistic body design gives the CB300R unique look which make the bike stands out from rest of the competition. The CB300R comes with fully digital instrument cluster which gives lots of information for the ride like speed, rpm, fuel gage, clock, gear indicator and warning light. The company has given LED headlamp and rear lamp. Honda CB300R is powered by 286 cc liquid cooled single cylinder engine producing 30.9 bhp of power at 8,500 rpm and 27.5 Nm of torque at 7,500 rpm. This engine is mated to 6 speed gearbox. The Japanese manufacturer is also focusing on reducing maintenance cost as the number of moving parts inside the engine is low compared to other engines in the same class. Honda has also given low-friction piston rings and high-density core radiator and the company is focusing on improving efficiency as the CB300R get iridium spark plug and 10 litres of fuel tank with an average efficiency of 30.2 Kmpl. Honda CB300R comes with 41mm telescopic front suspension and 7 step adjustable mono shocks at rear. The CB300R get 296 mm hubless floating disc with radial mount Nissin 4 piston caliper and 220 mm disc at rear with single piston caliper. Honda is also offering IMU based dual channel ABS system for CB300R. The wheels are 17 inches with 150/60R-17 at rear and 110/70R-17at front with Dunlop radial tyres. Honda has plans to enter mid-size motorcycle segment and CB300R is one of the ideal products for this segment.